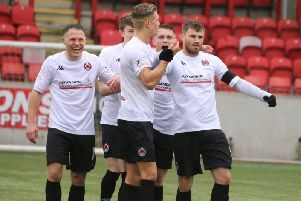 Cumbernauld United slumped to an unexpected home defeat in their third Central Sectional League Cup tie against Dunipace at Guy’s Meadow on Saturday. United had much more possession than the District Second Division team but failure to take the many chances they created and great defensive work by the Dunipace men caused this surprising result. United dominated the initial 20 minutes and efforts from Davie Dickson and Darren Bowie came close. But the Denny team took a shock lead when winger Ross Balmer met a right wing cross. United almost lost a second goal a minute later when a Barry Rodger header flashed past a post. The home team got things together again with Martin Shiels in particular catching the eye with some great play. The United man had a great shot which shaved the bar and then fed Chris Zok whose left foot shot was well saved by the ‘Pace keeper Sean Robertson. In the 40th minute, however, the lower league team increased their lead when another right wing cross found Joshua Gracie who slipped the ball past United keeper David Buchanan. United were shocked but got a goal back in the opening minute of the second half when the excellent Shiels was grounded in the box and Scott Murphy made his usual fine job with the resultant penalty. The home side pushed for an equaliser and headers from Davie Dickson and Chris Zok cleared the bar before a Willie Wells shot was well saved. But in a 57th minute breakaway the Denny team scored again, a long high ball from the right producing a great header from Alec Wade. Five minutes later United reduced the arrears again when, from a Dickson cross, Zok headed a fine goal. It was all United now but Craig Hughes in the Dunipace rearguard and his defensive mates were successfully blocking all the home team’s efforts. Bowie, Wells, Dickson and Shiels all had efforts at goal without success and in the 85th minute the young Dunipace boys wrapped up the points. In yet another breakaway substitute Dominic McGrandles beat Buchanan to severely dent United’s chances of progress. This result leaves United, Rob Roy and Kilsyth all tied at the top of the cup section with one game each on Wednesday, when United face Rob Roy at Guy’s Meadow and Kilsyth play Rossvale at Duncansfield) to decide which team goes forward to the quarter finals. The United supporters bus for Saturday’s league opener at Petershill leaves Guys Meadow at 12.15pm and the town centre at 12.20pm.